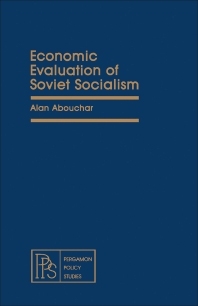 Economic Evaluation of Soviet Socialism examines the economic achievements of Soviet socialism from a variety of perspectives. The Soviet Union's failure to eliminate inflation and its implications for the economy are considered in comparison to a capitalist developed or industrializing economy. The effects of inflation on welfare and efficiency are also discussed. This book is comprised of eight chapters and opens by sketching the distinguishing characteristics of Soviet socialism as well as six major sources of interest in the evaluation of Soviet socialism. The next section deals with three kinds of issues relating to Soviet socialist performance: organizational-structural aspects, economic growth, and efficiency. Questions such as whether the Soviet economy may have been able to obviate the traditional undesirable consequences of inflation are addressed. The growth of the economy and of important macroeconomic aggregates, such as national income, industrial production, and consumption, is also analyzed. The remaining chapters focus on economic efficiency in agriculture and industry in relation to the Soviet price mechanism. This monograph will be of interest to economists, social scientists, policymakers, and government officials. Ability to Make Decisions or "Executive Ability"